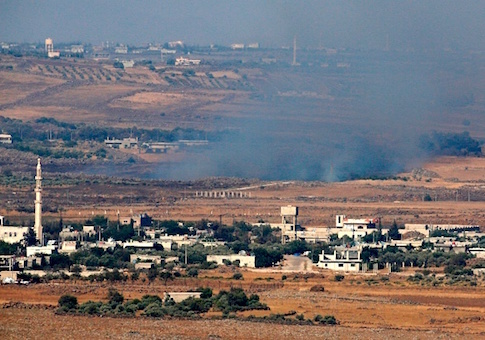 President Donald Trump is calling for the recognition of Israeli control over the contested Golan Heights region on Israel's northern border, territory that was originally controlled by Syria but annexed by Israel several decades ago following war. Trump, who became the first U.S. president to make good on a promise to relocate the U.S. embassy in Israel from Tel Aviv to its capital city of Jerusalem, is now pushing for recognition of Israel's control over the Golan Heights, a policy that Israel has also been pushing for. With Secretary of State Mike Pompeo in Israel for high-level meetings with his Israeli counterparts, Trump took to Twitter to call for the United States to recognize Israel's complete control over the territory, which would provide the Jewish state with greater leverage as it conducts counter-terrorism operations aimed at thwarting Iranian-backed militants such as Hezbollah, which operates in the contested territory with war-torn Syria. Pompeo was coy in his stance on the issue during a press briefing earlier Thursday with reporters. Asked about reports that the United States is considering recognizing Israeli control over the Golan area, Pompeo declined to provide a definitive answer. "Can you give us any insight into where that would stand?" a reporter asked. "Why not?" the reporter asked. "Is it being considered?" "I don't have anything to say about that," Pompeo said. "I'm not going to comment. We—the administration's considering lots of things always, and I try to make sure we get to answers before we talk about them publicly." Pompeo's trip to Israel comes during a contested Israeli election. Some have raised concerns that the secretary's high-profile appearances with Israeli Prime Minister Benjamin Netanyahu could tip the election in his favor. Congressional sources who spoke to the Washington Free Beacon about the unfolding Golan Heights issue said that it is now incumbent on lawmakers to pass GOP-backed legislation that would formally recognize Israeli control over the Golan Heights and allow the United States to begin sending military aid to Israel to help its fight against militants stationed there. Sens. Tom Cotton (R., Ark.) and Ted Cruz (R., Texas) have been spearheading the effort since December. The lawmakers reintroduced an even stronger version of that legislation in February. Cotton, sources said, recently engaged with both Trump and Secretary of State Pompeo on the issue. "We applaud the president for formally recognizing Israel’s sovereignty over the Golan Heights, an acknowledgement that enhances the national security of both Israel and the United States," Cotton said in a statement. "At a time when Israel's northern border is threatened by Iranian forces and their proxies in Lebanon and Syria, including by Hezbollah's rockets, armed drones, and newly discovered terror tunnels, this recognition will be great news for our ally and its right to self-defense." "More work remains to be done to align American policy with today's recognition," Cotton said. "We look forward to advancing our bicameral legislation on the Golan Heights which acknowledges Israel’s sovereignty over its territory, streamlines congressional language, and expands the basis for joint projects on the issue." "It's still very much a necessity to pass the bill," said one congressional source, urging the Senate Foreign Relations Council to advance the legislation to a full vote. "The president has given a pretty clear statement on his intent." Update 4:11 p.m.: This post has been updated with further information. This entry was posted in National Security and tagged Donald Trump, Israel. Bookmark the permalink.